Generally, I like my pancakes on the plain side. I go for buttermilk pancakes most of the time and, though I’ve been known to have a flavor or two, the thing that I most often add is blueberries. That being said, a little variation now and then is a good thing – hence the reason that I decided to cram so much flavor into these. These pancakes are really a basic, plain pancake with a lot of stuff added to them. I added banana, shredded coconut and chopped macadamia nuts as a sort of tropical combination. The shredded coconut actually works really well in the pancakes and, though you could certainly use coconut milk in place of the regular milk, I think that the coconut flavor might overpower the others at that point. I debated for a while about whether I should use butter or oil in these pancakes, especially since I have macadamia nut oil at home. At first I thought that using the mac nut oil would blend the flavors further, but it turns out that I prefered to have a bit of buttery flavor in the pancakes. The mac nut oil is extremely buttery for a vegetable oil, but the flavor was a little overpowering; the pancakes tasted a bit greasy. If you do decide to use a strong oil, I would recommending using only on tablespoon. Back to the pancakes, though. The coconut and banana played off each other very well, and both of the flavors melded right into the pancake. The nuts are entirely optional. I like these with and without nuts, so add them according to your own preference for having crunchy bits in your pancakes. These don’t really need syrup, since they taste great on their own, but I’m not one to argue against maple syrup. In a medium bowl, beat together milk, egg, melted butter and almond extract. Stir in coconut and banana, then pour into flour mixture. Add the macadamia nuts and stir until almost smooth. Heat a lightly greased griddle (or frying pan), over medium-high heat until a drop of water will dance around when dropped on the surface. Drop batter by heaping spoonfulls and cook about 2-3 minutes, until browned, before flipping to brown the other side. Continue until all pancakes are made and serve hot. I see coconut and I’m hooked. Lovely combination, Nic! Oh yummers these look tasey! oh man, I HAVE to make those!!! These look great! Any ideas on how to keep them warm for a brunch? 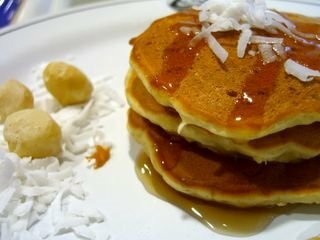 I love the Banana Macadamia Nut Coconut Pancakes offered at “Stacks” in the Bay Area (www.stacksrestaurant.com), so I had to give this recipe a try. The batter came out too thick and the pancakes a little too dense. Any ideas why? I may have over chopped the macadamia nuts. Still provides a good starting point. Thanks.